Paul Mason listens to an officer during a wildland training exercise in the Oakland hills. Since the 1991 firestorm, academy recruits are rigorously trained on more extensive wildland firefighting equipment. When the call finally comes in, he almost misses it. The sun is just beginning to dip toward the bay, casting long shadows over the engine as the crew makes its way back to Station 23. The day had been unusually slow for Oakland’s busiest fire station, but — of course — a call interrupted dinner. 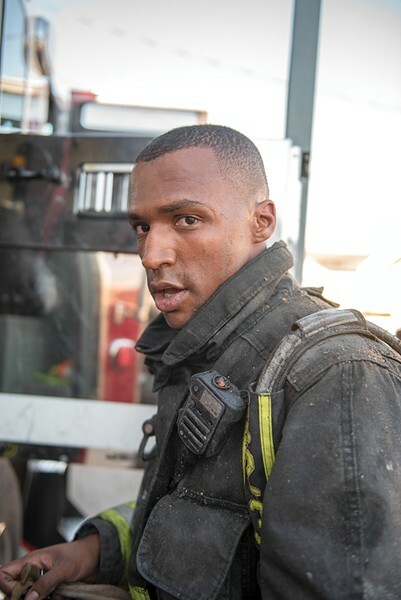 Rookie firefighter Paul Mason Jr., the team’s newest member, is watching the world pass by outside when his headset crackles into life. Mason has been on the job just 64 days. After graduating from “The Tower” — Oakland fire-speak for the six-story building recruits train on, rain or shine, during the department’s grueling eighteen-week academy — he’s spent the last two months bouncing around stations, wherever a “probie,” a firefighter on their probationary period, might be needed. He’s ridden on calls to chest pains and heart palpitations, child asthma attacks and neighborhood shootings. A “yellow alert”: a plane suspected of being in trouble over Oakland airport. A possible miscarriage. A car crash in the hills involving teens. And, just a few days ago, a burning trash pile outside an abandoned house. But in all that time, Mason has not yet had his first real fire. At 23 years old, he was one of the youngest recruits to graduate from Oakland’s most recent academy. His class joined a department that is fighting fires on the city’s streets and at City Hall. The department, known colloquially as OFD, made international headlines in the wake of last year’s Ghost Ship fire, after media outlets suggested that lack of proper fire-safety inspections may have led to the tragedy. Since, a second deadly incident, the San Pablo Avenue fire in March, and a string of suspicious blazes at construction sites, the latest of which displaced more than 700 people, has kept OFD on the front pages. OFD must also reconcile budget obstacles and cuts to social services that increase pressure on its call volume. The department currently has no fire chief. And it faces an even more acute problem: More than 40 percent of its working force has fewer than ten years’ experience in the department. A third of its working force has fewer than five years. 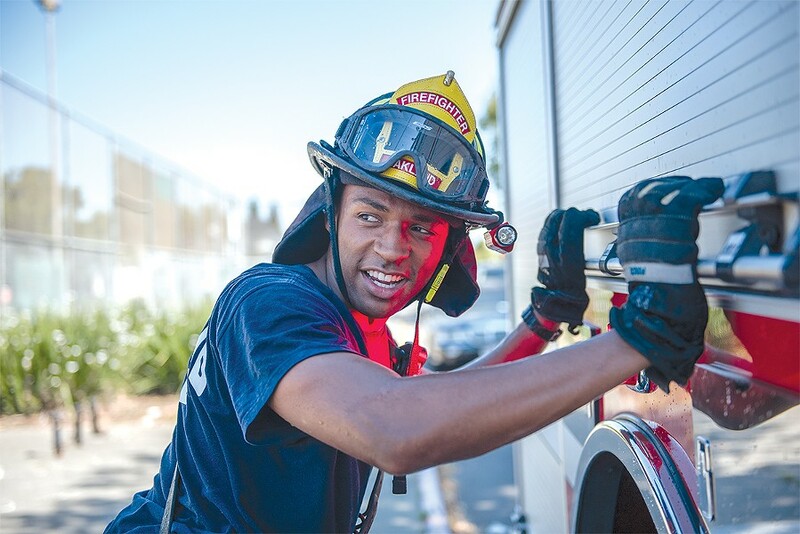 Mason — fresh-faced, eager-eyed, and still learning the ropes — is part of this cohort: the next generation of Oakland firefighters. It’s a significant challenge. But the department has one key advantage: Firefighters don’t have to wait long before Oakland gives them some hands-on experience. Back in the engine, Mason thinks this might be his moment. On the force, you come of age when called to a structure fire — a burning building — and when your engine is “first due,” arriving before the others. Moore leans hard on the horn, swings the vehicle into a clear path on the other side of the road, and the men race to change into their protective gear. Their engine is first due. During training, Mason was taught to wait until he reached the front door before masking up. But now he pulls on his breathing gear, ready to go. His heart is pounding. Less than two minutes after receiving the call, they arrive at the house: a modest, cream, single-story home in one of the city’s low-income neighborhoods. Flames jump from the back corner of the building. A crowd has gathered. A woman runs forward, shouting at them to hurry. Nine weeks out of The Tower, with smoke thick in the air, Probationary Firefighter Paul Mason Jr. faces the first fire of his career. No one else is coming. He can’t afford to choke. Mason had a list. In fact, he had two. At the top of the first list, he wrote: Things I do not want to do. Underneath, penned neatly, he listed: Retail. Office. Army. Police. College. He came from a family of degree-holders, but school had lost its shine. He knew he couldn’t be violent, even if the situation required it. And he knew he couldn’t face a lifetime selling lingerie. He flipped the page and wrote another: Things I want to do. This was harder. He thought about it a little, and then wrote: Help people. Earn for a family. Comradeship. Physical. There had to be a job, a holy grail of a job, that would check every box. An eternal optimist, Mason researched for a month. And then, one evening, his mom found him at the computer with the widest grin. “Mom,” he said. “I know. It’s a dream held by thousands, according to the number of applicants during OFD’s last hiring round. Of those who applied, only a handful made it to interview. And of those, even fewer made it into the department’s 2015 and 2016 academies. 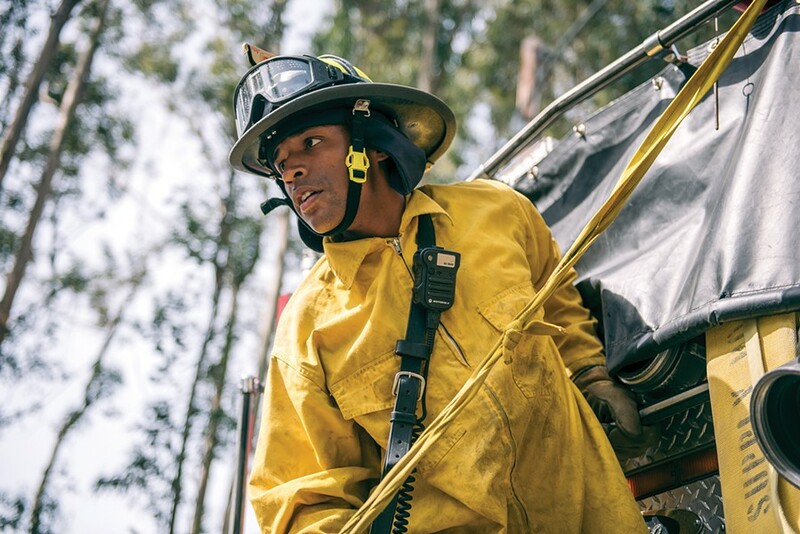 Aspiring firefighters choose Oakland for all kinds of reasons, but a big draw is the diversity of experience. The city’s dense residential neighborhoods are filled with aging buildings, where run-down electrical systems are at risk of sparking fires. In the hills, family homes sit next to eucalyptus groves, notorious for particularly intense burning. Downtown, high-rises loom over busy streets. The city is intersected by major freeways, home to wrecks and car fires. On the waterfront, the fire department responds to overturned boats and emergencies on the marinas. Oakland International Airport, meanwhile, has its own dedicated fire station with specialist equipment. Mason was an ambitious kid. Where a more rational wannabe-recruit might have aimed to make the academy in five or ten years, he told himself he was going to be a firefighter by the time he was 22. He started classes at Chabot College. He talked to crews on the street. He smiled. He shook hands. 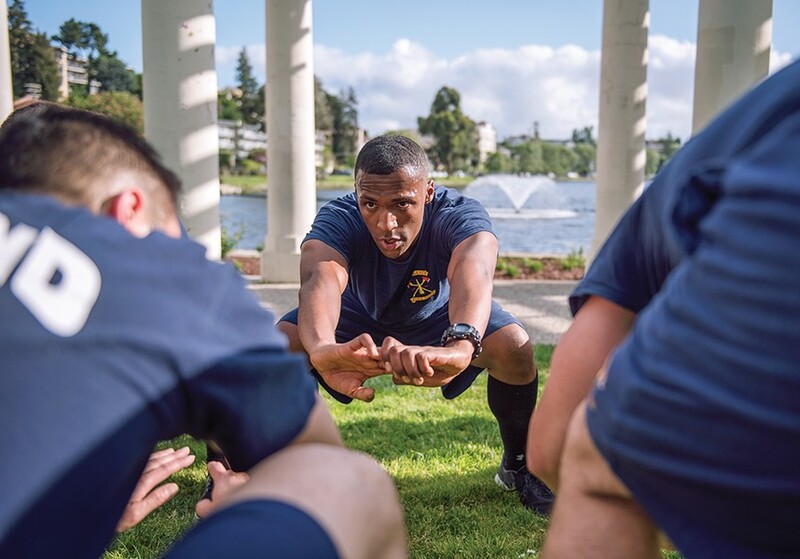 When he wasn’t selected for Bay EMT, a program that provides the mandatory medical training all OFD applicants need, he showed up to the first class, anyway. They let him stay. By the time Mason had completed his emergency-medical technician training, passed the written exam and two interviews required by OFD, and made it through eighteen weeks on The Tower, he was one of the last recruits to enter the force at the end of a four-year hiring blitz. Since 2012, the department has hired more than 140 new recruits, with 141 still on the force. In the four years prior, they hired none. The 2008 financial crash put pressure on the city budget, leading the city to lay off an OFD graduating class and implement a hiring freeze. The freeze was lifted in 2012, and a boom ensued. More than eighty firefighters were hired in 2015-16 alone. Mason’s class, known as 2-16, was the largest to graduate since the recession. However, the department remains understaffed. Of 508 budgeted positions, 42 are unfilled. And while that means there may be 466 department employees, the number of sworn staff working in Oakland firehouses over a shift cycle will be even lower after taking into account those working in administration or away on long-term leave. An understaffed department means more pressure on employees across the board. Firefighters who spoke to the Express described mandatory overtime last summer as “out of control.” They said they were routinely asked to work the days between scheduled shifts, sometimes totaling 96 hours on-call. Leadership hopes the latest round of hiring will ease the need for mandatory overtime. But introducing so many new firefighters to the department at once brings another kind of challenge. “Now, you got the new teaching the new,” Robertson said. The veteran firefighter has been on the force since 1989, back when firefighters would still ride their engine’s tailboard to calls. Now a lieutenant, he works at Station 4, Oakland’s oldest firehouse. The station’s insignia resembles, appropriately, the Jurassic Park logo. Mason and his classmates sweat on the infamous Chief’s Run. Led by battalion chief James Bowron, new recruits are put through a brutal workout around Oakland’s Lake Merritt at the end of a long day. Some probies arrive with years of experience on other forces. Some come straight up through college and high school firefighting programs. Having fire experience can be a boon for the “new kids”; nothing beats having calls under your belt. But according to Robertson, life experience is more important than fire experience. “You gotta learn how to get along with people,” he explained. It’s about knowing how to talk to folks on the street, as well as knowing how to pull hose. “If I was running the show, I wouldn’t want to hire anyone who was younger than 25,” Robertson mused. Though, he permits, there are always exceptions to the rule. Mason beamed as he was handed his badge under the bright lights at his graduation ceremony. His parents pinned it on his navy uniform, proud that their son had found his calling. Ahead of him lay eighteen months on probation, a period when new firefighters are watched day and night by crewmates and expected to learn every facet of their job. Step out of line, and they can be dropped from the force. There are daily evaluations, training exercises, laundry to fold, and bathrooms to clean. There’s no room for slacking. On probation, a new firefighter works at different firehouses across the city, rather than being assigned to a single station. The arrangement exposes them to a variety of firefighting scenarios, but it also means they never have time to settle. Now, nine weeks into his service, Mason has momentarily come to rest at Station 23: The House of Pain. According to the map in the hallway, Station 23 sits smack in the middle of its East Oakland district, jammed in the crevice between Foothill and MacArthur boulevards. The crew serves an area that roughly encompasses the Interstate 580 freeway to International Boulevard, bookended on both sides by 55th and 85th avenues. It’s the busiest station in Oakland, making roughly 4,600 runs a year and averaging thirteen calls a day. Thus, its moniker. Mason addresses an officer as the class is kept late. 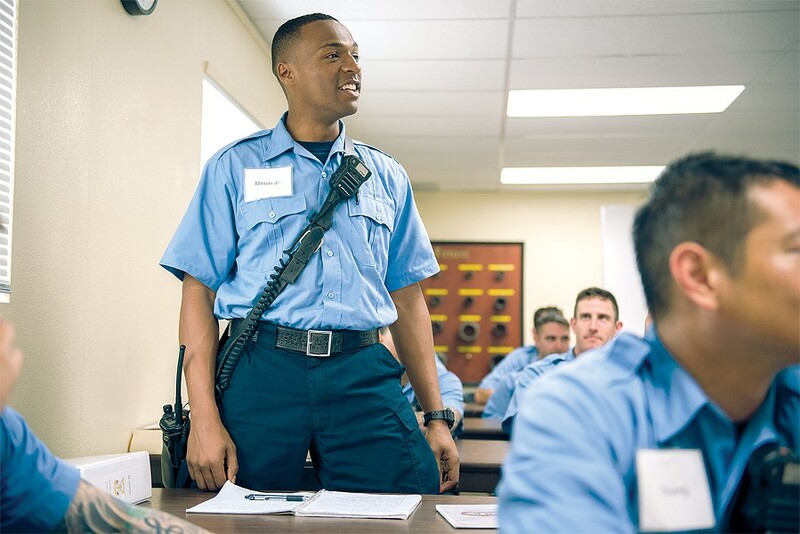 At the academy, recruits train on the tower and in the classroom. Their day begins before dawn, and can last into early evening. The neighborhoods the station serves are diverse. In the sprawling hills above MacArthur Boulevard reside upper-middle income families, while dense neighborhoods in the flats are home to poorer residents. Over a third of children here live below the federal poverty line, in homes built more than fifty years ago. A majority of the station’s fires happen here, south of Bancroft Avenue. This part of the city is crowded; buildings have been divided into multiple units, and houses stack up against each other on narrow residential streets. Old buildings may not be up to code, or have undergone dicey renovations. Rental units also increase a neighborhood’s fire risk, as these buildings tend to have less regular maintenance. Residents who have had their electricity cut off sometimes rewire their supply. Abandoned buildings can attract the homeless and addicted, gathering trash around open flames. On calls this side of town, firefighters wearing navy blue button-downs instead of OFD T-shirts often get mistaken for cops. But the department is trusted. Sometimes people show up at the station for help; “door stops” in fire-speak. On his first morning at 23, Mason arrived back from a call to find a couple in distress. Her arm was bruised, and his shirt was torn. The firehouse can feel like a safe place to shelter when things go wrong. With Station 23’s particularly heavy call volume, Jeddi has reason to drill the probie hard. But the fire department is experiencing an increase in calls citywide. Firefighters attribute this to social-services cuts, which makes 911 the only realistic health-care option for poor residents. Of the 60,000 calls the department answers annually, more than 80 percent are for medical assistance. Mason steadies himself on the engine as his boots are hosed down, after attending an outside fire at an abandoned house with the crew at Station 23. Meanwhile, OFD has failed to leverage funding for additional services in recent years. According to Robertson, who is president of the Oakland firefighters union, union maneuvering has prevented staffing losses and protected firehouses from being permanently closed — though stations were shut on a rotating basis between 2011 and 2014. Still, firefighters express concern that some areas of the department are chronically underfunded. But, as Robertson noted, it’s hard for the general public to tell if the department is struggling. When Oaklanders call, they always show up. The only hint that something might be wrong is when OFD also arrives in the headlines. In recent years, the department has dealt with an unprecedented number of high-profile fires. Last December, 36 people died at a warehouse in the Fruitvale neighborhood: Ghost Ship, the deadliest structure fire in the United States in a decade. Three months later, four were killed after an unattended candle caused a blaze at a housing facility on San Pablo Avenue. In both incidents, the department’s fire prevention bureau was heavily criticized for not inspecting the buildings, or for failing to act on what they found. At the time, just six fire inspectors were available to investigate more than 4,200 commercial and residential properties across the city each year. The Ghost Ship warehouse was not even in their database. The city’s latest budget will fund a total of twenty inspectors, though OFD has yet to hire the additional employees. The department has also responded to several suspicious blazes at Oakland construction sites, which investigators believe may be linked. Last month, a four-alarm fire destroyed a mixed-use housing complex under construction near Lake Merritt, temporarily displacing more than 700 people. A site on the Oakland-Emeryville border was targeted in July 2016, and again in May this year. And last Halloween, a blaze a couple blocks east of Lake Merritt on Lester Avenue gutted another structure. So far, there have been no casualties, but investigations into the fires are ongoing. The department is also currently missing a key member: its chief. Former chief Teresa Deloach Reed resigned in March amid investigations into the Ghost Ship blaze. As well as pointing to the failures of the fire prevention bureau, her critics complained that the department had lost its certification to perform hazardous materials inspections, failed to apply for grants to supplement city funding, and mismanaged a hills inspection program designed to protect the city from another deadly firestorm. The new chief will need to address these concerns, and grapple with the department’s diminishing funds. To pass the latest city budget, an academy class slated to begin this fiscal year was de-funded at the eleventh hour by city council — meaning Mason and the rest of 2-16 will be the last recruits to join the force until at least 2018. Decisions at the top impact the safety and efficiency of crews on the ground. Lieutenants and probies alike know the risk of another hill fire, an incident on the waterfront, or an earthquake on the Hayward Fault. Just two weeks ago, Mason’s colleagues were battling a twenty-acre brush fire in the hills on the city border. The department has to be ready. In Oakland, once-in-a-career calls happen more often than you’d expect. At Station 23, late morning light streams onto the kitchen table. A copy of Fire Engineering sits on the counter. On the wall, a giant collection of photographs smile out from behind glass: crews giving thumbs-up in yellow wildland gear; Polaroids from the Eighties, all mustaches and mullets; arms around shoulders in front of shining engines; birthdays with cake. Mason mops the garage floor, whistling a tune. Cooking and housework are pretty new to him. Getting this job meant he could finally move out of his mom’s place in San Leandro and into a two-bedroom townhouse up the hill with a buddy. But their fridge is stocked with cold pizza, and for now their living room is missing most everything but a WiFi router. For a young man like Mason, the fire department is where he’ll grow up. Old hands describe the job in turn as a lifestyle, a home, and a second family. Whether he realizes it now or not, his crewmates will be the friends at his wedding. When he brings home his first newborn, he’ll be the one making the old joke: I get more sleep here! To get this far, Mason has had to make firefighting his life. But the job takes a toll on both mind and body. Firefighters are at greater risk of heart disease and certain types of cancer, and stress can also leave scars on firefighters’ mental health. And, even without health problems, Mason can’t be a firefighter forever. Class 2-16 can retire with full pension at 57, but it’s an unlikely prospect. Older firefighters get injured more easily, and take longer to recover. “I think that’s going to lead to probably more disability retirements,” Robertson predicted. Firefighting in Oakland’s flatlands, he said, is a young man’s game. And the new guys are, overwhelmingly, guys. Women make up only 10 percent of the department’s rank-and-file firefighters, according to the Los Angeles Times — though this is better than the national average of 3.5 percent. Whether he’s on a run or not, every instant Mason spends on shift is a teachable moment. In the engine, and over lunch, and leaving the grocery store, he’s asked to imagine invisible fires. If it happened here, what would he do? Even when he finishes probation, it’s a state of mind Mason will need to carry with him throughout his career. Small mistakes, through carelessness or over-confidence, can cost lives. “This is one of those jobs that has a way of punishing you, when you get caught slipping,” Robertson explained. Out on the street, well-wishers regularly approach crews. There’s a perception of firefighters: the kind of person who runs toward danger. It’s something firefighters themselves are generally uncomfortable with. Crews even wind each other up by mentioning a teammate’s rescues, or by calling them a hero. Do they feel proud? Sure. But it’s just the job. And anyway, as any rookie will tell you, firefighters only walk into burning buildings. Mason takes a moment to breathe fresh air by Engine 23 after putting out his first structure fire, before returning to the burned house to assist with overhaul. Outside the cream house choked with smoke, Mason’s job is simple: to pick the right hose, to lay it out so it won’t twist, and to get the nozzle to the door. But standing next to the engine, Mason freezes. He didn’t get a good look at how far away the fire was, which would tell him what hose to pull. He stares up at the two cross-lays on the engine. Behind his mask’s plastic visor, his eyes widen. This is the moment he has prepared for, the proverbial “big one”: the probie’s first fire. And he doesn’t know which hose to choose. His partner, Valerio, takes his shoulder. “Slow down,” he says. “You got this.” Valerio reaches up and selects 150 feet of yellow hose, and together they pull it toward the entrance. The house is divided into two units, the men realize now. The back unit is burning. They follow a short driveway, where flames jump out of a broken window and along the roofline. The smoke thickens in front of their masks. Mason takes the nozzle from his partner and kneels in front of the door, plugging into his air supply. Each breath sounds like a gasp. Inside, the house is pitch black. Flames stretch across the ceiling of the first room. Mason opens the hose and knocks them back, and the pair moves forward, keeping close to the floor, where the smoke is thinnest. Shuffling in the dark, Mason bumps into a couch. Couches are usually pushed against walls. They’re at the edge of the room. “Where do I go next?” Mason shouts. Toward the heat, Valerio responds. They move right, into what feels like a hole in the wall. Mason reaches up and finds a doorknob. It’s a doorway. Flames dance in front of them, overhead. “Hit the ceiling again,” Valerio says. Mason opens the nozzle in a single quick burst, pushing the fire back. The water falls down on them, hot and hissing. They shuffle forward again, into a narrow hallway, and pause, listening. Over the sound of his shallow breathing, Mason can hear the fire in the next room. The floor is so hot, his knees feel like they’re burning. They scoot forward toward the heat. With one leg in the bedroom doorway, Mason leans back to hose the ceiling. The “seat” of the fire, the source, is here. It’s hard to see flames through the smoke, but Mason douses the glow coming from a mattress. Outside, three other engines and a truck crew have arrived. Debris begins to spill down on Mason’s helmet. They’re cutting a hole in the ceiling. Mason backs into the hallway, and a moment later the smoke begins to clear through a jagged tear in the roof. The duo stands in the doorway, looking at what’s left of the bedroom. Now, clean-up. For another two hours, the crews stay to conduct “overhaul”: pulling out walls and ceilings to check for missed embers, hosing down the interior, removing debris. Open doors allowed this fire to move quickly through the house. The firefighters sift through the remains to find what can be salvaged. Mostly, though, the things that made this place a home are left charred and sodden in the front yard. As crews pull out half-burned chairs and a blackened space heater, a lieutenant approaches the young man who has been waiting on the sidewalk. They didn’t arrive in time to save his pit bull. Mason is exhausted. The heat has made even his helmet feel heavy, and his adrenaline dissipates with the smoke. He finds some photographs, untouched in a closet, and he knows he mustn’t get emotionally involved in the task at hand. The long shadows have darkened into twilight by the time the crews leave. Back at Station 23, half-eaten bowls of taco salad sit on the table illuminated by a flickering television. Mason’s muscles cramp, his head aches, and the side of his face is streaked with soot. Everyone smells of the fire. Finally, at one in the morning, he lies in a sleeping bag in his small room next to the garage bay. The fire leaps in his memory. He thinks about what he did in the house and the way he looked at those yellow cross-lays. He thinks about the pit bull. When he arrives for his next shift, he’ll bring a pint of rocky road. He’s been told it’s tradition for a new recruit to bring ice cream after their first fire. Outside, the city rumbles, wild and restless. In the hallway, a few feet from the sleeping firefighters, Station 23’s alarm waits in the dark.